It’s easy to fall in love with a golf course…all you have to do is go out and play well there. Yet when you have been the best player in the world, such love affairs are rare and only the very best courses – and sites – can seduce you. Yet Greg Norman is unashamedly rapt in his latest masterpiece, the Cathedral Lodge Golf Club which he has completed north-east of Melbourne. The Great White Shark was on hand to be among the first to strike an opening tee shot when the course he designed for former Essendon Football Club president David Evans officially opened. 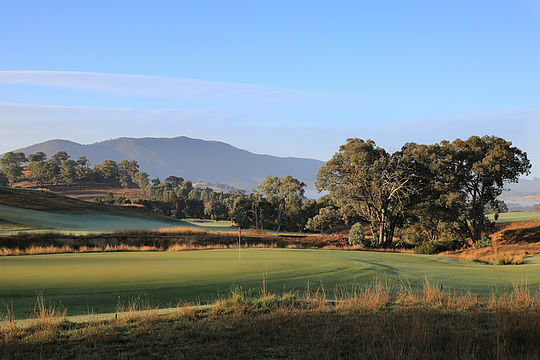 Indeed Norman, who once rated the late Kerry Packer’s Ellerston near Scone as being among his best work, already considers this latest golfing masterpiece as among the finest courses in Australia. Nestled on the Goulburn River in a landscape dotted with creeks and gorges, Norman has put his seal of approval on Cathedral Lodge Golf Club. “Cathedral Lodge is very special to me as there is nothing else like it in Australia, or the world for that matter,” said Norman. The opening completes a vision that Evans has harboured since he first visited Augusta National, home of the US Masters about 20 years ago. He found the land near Thornton, about 130km north-east of Melbourne and when he met Norman and showed him the site, the Shark was ‘hooked’. Norman was in town from the US, along with Victorian Premier Daniel Andrews, also a passionate golfer, to cut the ceremonial ribbon on a project they hope might one day host a major golf event. “I just fell in love with what Augusta is, what it stands for,” said Evans. “That trip triggered the idea of planning for what has become Cathedral Lodge. “I asked myself whether it could be done in a way that created a unique recreational place for Australian families with golf at its core. “Part of the dream is to have a major tournament there – an ongoing legacy as the US Masters is to Augusta. Cathedral Lodge will be a members-only club, with buy-in for first timers expected to be around the $50,000 mark with on-going fees of $10,000.